A young woman is pushed to the edge by a world filled with police brutality and government corruption. But she's decided to fight back. Lighting a fire that will spark a modern American revolution, she is Scarlet. And this is her epic story: the now-classic SCARLET BOOK ONE. After a mysterious murder and a near-death experience, Scarlet Rue awakens from a coma with her world shattered. Fueled by rage, guilt and her vision of a better future, she takes the fight to her oppressors...and anyone else who gets in her way. 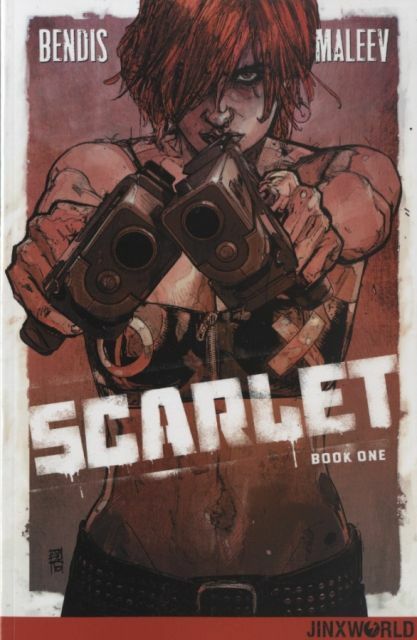 From writer Brian Michael Bendis and artist Alex Maleev, the award-winning powerhouse creative team behind Daredevil, Iron Man and Moon Knight, comes an honest, no-holds-barred tale that tackles some of the most prevalent issues in modern American society in SCARLET BOOK ONE. This new trade paperback edition from Jinxworld re-collects issues #1-5 of the original classic series.